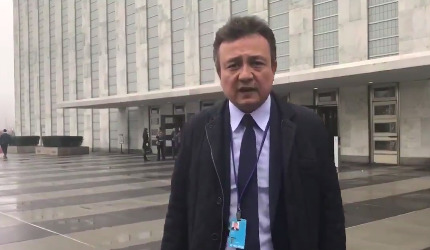 After nearly 2 weeks of confusion and rejection, UNPO Vice President and World Uyghur Congress President Dolkun Isa was finally allowed to enter the UN premises and participate in the Permanent Forum on Indigenous Issues on April 25th. Despite being approved to attend the Forum weeks in advance and being re-approved via email just last week, Mr. Isa was twice prevented from entering the UN premises to participate in the Forum. Isa’s entrance required the intervention from the UN Permanent Missions of the United States and Germany. While the UNPO is pleased that Mr. Isa was finally allowed to attend the Forum and sincerely thanks all those involved in ensuring his participation, the situation should have never arisen in the first place. Mr. Isa followed UN guidelines, was approved weeks in advance and no credible reason existed to prevent his participation. The fact that he was rejected from entering the Forum multiple times is a troubling indication of China’s increasing influence within the UN system, especially at the UN Department of Economic and Social Affairs (UN DESA), which oversees final participation decisions. China’s attempts to silence Mr. Isa and prevent his participation in a Forum specifically designed to give marginalized and unrepresented peoples a voice should be of great concern to the international community and the UN. The actions by the Chinese Permanent Mission represent a critical threat to meaningful civil society participation. It constitutes a challenge to the basic values and principles that the UN was founded upon and to the integrity of the organization itself. The member states of the UN must be vigilant of creeping Chinese influence in the UN and speak out against this clear violation of UN principals and protocols. It will be a tragedy if China is allowed to violate the basic human rights of activists within the UN itself without a response from the international community. The international community must find the courage to hold China accountable for abusing the system itself. It was only through the significant efforts of UN members states and UN officials that Mr. Isa was allowed to participate at all. It will require similar efforts to ensure that the UN remains an organization that is inclusive and enshrines human rights in all aspects of its work. If we want a collective future that enshrines the principles and values that the UN was founded on, we must all work to defend it.